To many, lasagna is a multi-layered pasta dish with ricotta cheese between the layers, all of which are bathed in a rich tomato sauce and topped with melted mozzarella cheese. Any number of cheeses can be added, along with spices and herbs, to the ricotta, depending upon the cook’s preference. As has been mentioned, my family’s recipe doesn’t use ricotta at all, as you’ll see in some future post. 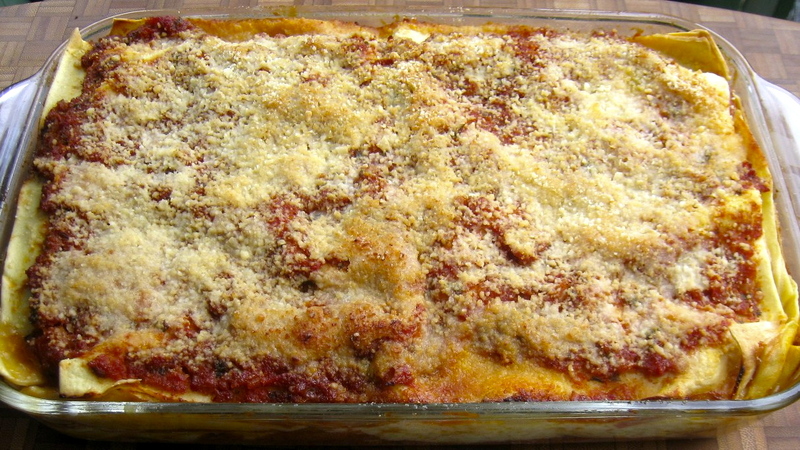 This post, however, is devoted to a 3rd lasagna, a recipe that I saw on some PBS cooking show about 20 years ago. It is, by far, the lightest of the 3 lasagne, with a unique blend of flavors. Today’s recipe consists of layers of pasta, each topped with either a marinara or a parmesan-flavored white sauce (besciamella), with mushrooms and prosciutto thrown in for good measure. 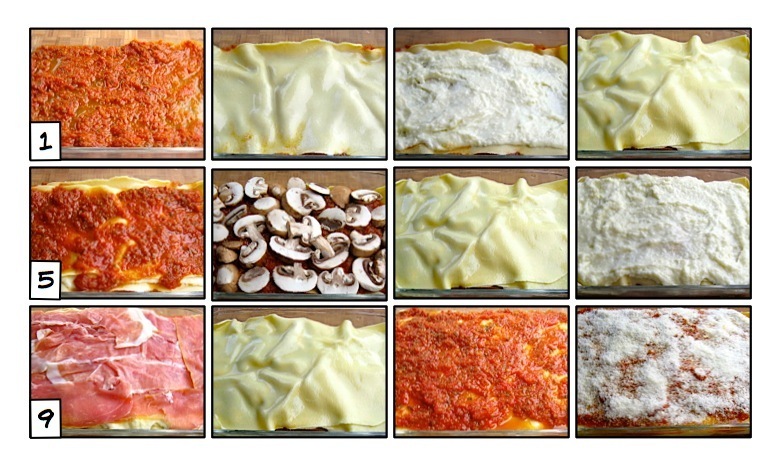 No, it’s not at all like most lasagna recipes but still a good one, nevertheless. If, however, it’s not lasagna unless you see ricotta and mozzarella, then this dish probably isn’t for you. That leaves all the more for the rest of us. Recipe found here, Marinara Sauce. Melt butter over a low flame. Add corn starch and whisk until smooth. Add 1 cup of the milk and whisk until milk begins to thicken. Add the rest of the milk and whisk until it, too, thickens. Add the egg and stir vigorously to insure that egg is blended before it cooks. Add parmesan cheese, stir to combine, and remove from heat. Generously butter a 9 x 13″ baking dish or pan. Coat the bottom of the dish with red sauce. Add 1 layer of noodles and then coat them with 1/2 of the white sauce made above. Add a 2nd layer of noodles and then a coating of red sauce. Add the mushrooms in an even layer atop the sauce. Add the 3rd layer of noodles, covering them with the rest of the white sauce. Cover this layer with all the prosciutto. Add the 4th and final layer of noodles, cover liberally with red sauce, and sprinkle the top with as much parmesan cheese as you like. Place in pre-heated oven and bake until heated through, 40 – 45 minutes. Let rest 10 minutes before serving. I’ve not toyed with this recipe at all, since seeing it prepared many years ago. For my tastes, it’s fine the way it is. Should you add a little something to improve the dish, however, drop me a line. I’d love to give it a try. This entry was posted in Pasta/Rice/Soups (Primi Piatti), Vegetarian and tagged Cooking, Food, Italian, Pasta, Recipes by ChgoJohn. Bookmark the permalink. I’m willing to part with tradition this once. :) Seriously, that looks amazing. Prosciutto, mushrooms, white and red sauce. I’m there! I wish I could remember the chef that I watched make this recipe years ago so that I could send him a thank you. Adding prosciutto to lasagna? Simply brilliant! Interesting recipe! I was expecting the mushrooms to be sautéed before being added to enhance the flavor and avoid getting too much liquid in the lasagna. I like the idea of adding a layer of prosciutto. Thanks, Stefan. I had yet to develop a following when I posted this recipe. Had I thought that people would actually be interested in these recipe, I may have held onto this one for a while longer. As for the mushrooms, the original recipe used whole mushroom caps. I did not like that at all. The mushrooms didn’t cook nearly enough and serving the lasagna was problematic. I very much prefer using sliced. I’ve made a similar lasagna before, although I’ll often use lasagna noodles that I’ve made with spinach when I do so. 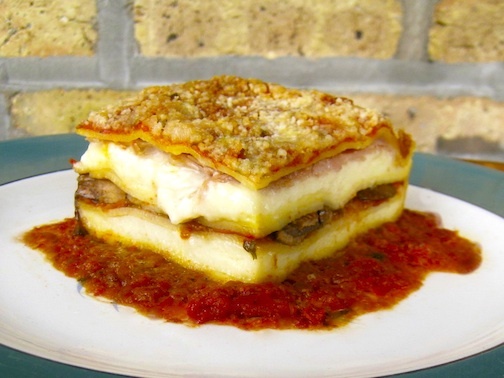 I’ve never used prosciutto in a lasagna — great idea, and I’ll try it sometime. I often (almost always) use mushrooms (often as a topping — they’re the next-to-last layer, the last layer being a sprinkling of Romano or Parmesan; so if I top with mozzarella, these go on top of that). Anyway, although I like lasagna made with besciamella, I more often make it with ricotta. Good stuff — thanks. We think very much alike, John. I use spinach noodles to make lasagna verde when I make a ricotta-based lasagna. I find that they have too strong a flavor for this besciamella-based lasagna. They do add a nice flavor component, though, to a ricotta-based one. Thanks for always leaving thoughtful comments. John, absolutely delicious. I am craving lasagna now! Thanks, Judy. This is a very good lasagna to make. I’m sure you’d like it. Hello and welcome! Rest assured, I have not changed the lasagna recipe of my Mama and Zia. That recipe can be found HERE.